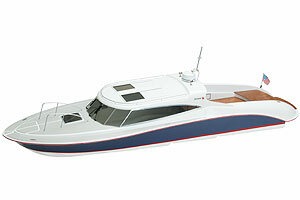 RC sports motor yacht. Semi-scale model based on original documents, for single electric motor. For two-function radio control. Quick-build kit including CNC-trimmed moulded hull and lasercut wooden parts. Quick-build plan, illustrated assembly and RC installation instructions in German, English and French. CNC-trimmed, vacuum-moulded ABS parts: hull, deck, RC cradle, cockpit roof, grey-tinted clear cockpit glazing unit, pre-cut cockpit back panel, stern hatch cover and other small vacuum-moulded items, pre-formed wire railing and mast components, wire and rod, small items for the steering system, Hydro power unit, shaft couplings, propeller shaft, boatstand, motor mount, complete fittings set, decal sheet and small items.